The weather is beautiful and the smell of fresh cut grass lingers in the air, well it must be baseball season again, ladies and gentlemen. The time of year to sit outside in the sun and enjoy America’s favorite pastime and what better way to enjoy it than by watching our beloved Oregon Ducks take the field. 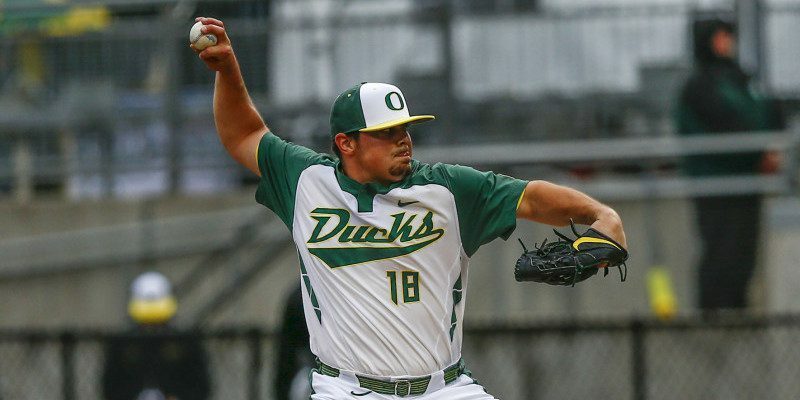 The Ducks recently went against UC Riverside on Wednesday where they walked away with the win. But no one gathered quite as much attention as junior Josh Graham. He finished the game with a career high, he was 3-for-5 with six RBIs and a run scored in the third inning with a grand slam – his second career slam. So far this year he is 3-for-7 (.429) with double at the plate and also throwing 3-2/3 scoreless innings with no hits and five strikeouts. Graham is an Oregon native and better known for his role as catcher. What’s that old saying? “Once a catcher always a catcher” — well, in the case of Josh Graham that couldn’t be any less true. At the NMSU game while on the mound in the eighth, he caught a pop-up – but not before he flips his hat off in true catcher form. As tweeted by Oregon Duck Baseball. Just goes to show you that Graham isn’t all serious all the time and to show you how funny he can be, you can see his version of that life-altering time when he signed with Oregon. This Duck has a little comedian in him. What can we expect from Josh Graham next? Hang loose, my friends — it could be a very entertaining ride.